Columbia-TriStar, widescreen 2.35:1/16x9, standard 1.33:1, languages: English DD 5.1 [CC] & Dolby Surround, subtitles: English, Spanish, French, single side-dual layer, 28 chapters, rated R, 101 min., $24.95, street date 5/23/2000. Directed by Stephan Elliot. Starring Ewan McGregor, Ashley Judd, Patrick Bergin, k.d. lang, Jason Priestley, Geneviève Bujold. What do you call a thriller that's not thrilling? Eye of the Beholder, apparently. Stars Ewan McGregor and Ashley Judd experienced terrific years in 1999. McGregor starred in the smash Phantom Menace, which may have disappointed legions of Star Wars fans but certainly cleaned up at the box office. (As a long-time SW guy, I actually liked it, but I'm clearly in the minority.) Judd snared a sleeper hit with the truly-terrible Double Jeopardy; the movie - a feeble rehash of The Fugitive - stunk, but it did surprisingly well at the box office. Add to that a moderately successful director in the form of Stephan Elliott (Priscilla, Queen of the Desert) and one might think the film had some promise, but unfortunately, that's not the case. EOTB comes across as a fairly pointless and meandering thriller that offer very little excitement or intrigue. McGregor plays "The Eye" (yup - that's the only name we hear), an intelligence agent working for the British embassy in the US. He receives a case to check out a babe (Judd) who seems to be blackmailing the son of a diplomat. Essentially, the rest of the movie follows The Eye as he follows Joanna as she does some pretty nasty things. The Eye develops a pretty serious crush on Joanna (kids!) for reasons that never seem terribly clear - other than Judd's babealiciousness, I suppose - and the entire thing meanders toward a vague conclusion. Although as you watch the movie it appears some things are happening, EOTB really seems like a whole lot of nothing. Both McGregor and Judd are appealing actors, but neither makes much of an impression here. The plot seems unnecessarily convoluted - especially considering the simplicity of the inane premise - and takes us on all sorts of twists and turns that really don't seem to go anywhere. Elliott has a lot of visual flair and apparently did quite well for himself with Priscilla (I never saw it, so I can't say) but he strikes out with Eye of the Beholder. I feel bad having to say so, for Elliott's commentary makes it clear he put a lot of work and passion into this film, but unfortunately that effort doesn't create much of a film. EOTB isn't terrible, but it does provide a surprisingly dull and lackluster affair that does little to thrill or entertain. 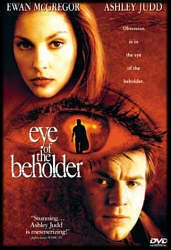 Eye of the Beholder appears in both its original theatrical aspect ratio of approximately 2.35:1 and in a fullscreen edition on this double-sided, single-layered DVD; the letterboxed image has been enhanced for 16X9 televisions. Only the widescreen version was reviewed for this article. I can't call the picture completely flawless, but it seems awfully close. Sharpness looked positively smashing, with an image that appeared consistently extremely crisp and well-defined and no hints of softness. This all comes with no evidence of distracting moiré effects or jagged edges, and even the usual artifacts from the anamorphic downconversion on my 4X3 TV were very minimal. The print used for the transfer seemed nicely clean and fresh; I noticed no scratches, speckles, grain or other flaws during the movie. During brighter scenes, I could detect some slight digital artifacts, but these seemed very minor. Colors were wonderfully vivid and deeply-saturated; they appeared bright and bold when necessary and also could be cold and relatively neutral as the situation dictated. Black levels seemed dark and rich, and shadow detail was nicely opaque but not overly so. All in all, this DVD provides a simply fantastic picture. The film's Dolby Digital 5.1 soundtrack seems equally strong. The movie features a terrifically involving soundfield that's one of the best I've heard. Audio appears very well-localized and the mix usually surrounds you with all sorts of appropriate noises. I didn't find the activity level to seem gratuitous; all of the ambient sounds were logical and appropriate extensions of the soundfield. All together, the audio blends and pans tremendously well and presents a very seamless environment. One of the best examples occurs when McGregor hallucinates multiple versions of his daughter, and as the camera moves from room to room, a new "Lucy" gets added to those already seen. We continue to hear the old ones as each additional girl becomes added to the mix; each comes from a different place in the apartment, and their sounds get placed precisely in the environment. That's just one of the many really cool sonic moments during EOTB. All of those tricks would mean nothing if the quality seemed poor, but happily, the audio of EOTB sounds terrific. Dialogue appeared consistently warm and natural, with no intelligibility problems. Music was clear and very smooth and presented terrific low end; the score features a lot of fantastic bass that really pumps up the action. The effects were clean and realistic and didn't betray any hints of distortion. This isn't a film to watch late when neighbors may be disturbed, as it's a surprisingly loud affair that really packs a solid punch. EOTB doesn't toss in too many extras, but at least one of them is strong: the audio commentary from director Elliott. It's actually much more compelling and entertaining than the film itself. Elliott talks almost nonstop and offers a tremendously fascinating account of both the creation of the film and some of the woes of the low-budget filmmaker. He covers a lot of ground and virtually all of it seems interesting. Although he seems too close to the film to note its flaws, Elliott nonetheless is quite frank and straightforward with his opinions. It's an absolutely stellar commentary that's not to be missed. Less strong are the remaining supplements. We find "Talent Files" for Elliott and actors McGregor, Judd and Jason "Please let me distance myself from Brandon Walsh!" Priestly; these are the usual crummy entries that mar most Columbia-Tristar DVDs. We also get trailers for EOTB and McGregor's The Pillow Book; I always thought the latter film seemed uninteresting to me, but the preview's cool enough that I might have to give it a spin! Finally, the DVD's booklet includes some brief but good production notes. Eye of the Beholder contained a lot of promise but most of it seems squandered in this visually-sharp but otherwise dull and uncompelling thriller. The DVD itself, however, is excellent; it provides absolutely stunning picture and sound plus a terrific commentary from the director. If the movie had been just good, I'd wholeheartedly recommend the DVD because so much else on it is strong, but unfortunately the lackluster spirit of the film makes this one to skip. Official Site--Contains production notes, synopsis, cast info, stills and clips. James Berardinelli's ReelViews--"Eye of the Beholder has a laundry list of problems, the biggest of which is the storyline, which is riddled with credibility holes and logical gaps." MovieThing.com: Ashley Judd--A terrific site where you can find full bio of Ashley with plenty of pictures, postcards, and a forum. Also profiles other celebrities. Ewanspotting--"The purpose of this site is to provide information for fellow fans and those who want to learn more about the most exciting young actor working today." Amazon.com--Available to purchase are the DVD at special discount and the novel by Marc Behm.